A friend mentioned to me today about her Andiroba oil and how much she loves it, that gave me an incentive to make a post on it today. 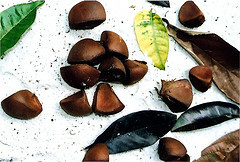 “Fruit from the Andiroba tree contains Kernels (seeds) which are rich in oil. Cold pressed Andiroba seed oil is considered antiseptic, antifungal, antibacterial, antiviral and a dental agent. Andiroba seed oil has been used for centuries in traditional rainforest medicine to aid in the healing of topical skin disorders such as eczema, psoriasis, rashes, burns and acne. It is rich in fatty acids and glycerides and, together with its healing properties, provides an excellent natural moisturizing base for skin care formulations.